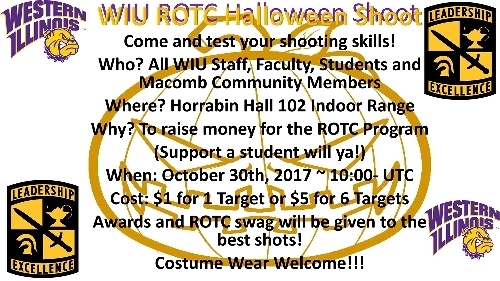 MACOMB, IL -- The Western Illinois University ROTC Rifle and Pistol Team will host its annual Halloween Shoot, beginning at 10 a.m. Monday, Oct. 30, at the indoor range in Horrabin Hall 102. The event raises money for the Rifle and Pistol Team and is $1 per target, or $5 for six targets. Air pistols will be used to shoot at the targets. Awards will be given to the best shots and participants are welcome to wear costumes. A bake sale will also be held in conjunction with the event. The event is open to members of the WIU and Macomb communities.